Fall is here, and the sports frenzy is in full swing. October is the only month when we can enjoy pre-season, regular season and play-off games for baseball, basketball, football and hockey. Sports fans are in sheer heaven. 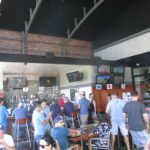 I set out to find the “stand out” sports bars right here in Newport Beach. Keep in mind that this is based on my opinion, and does not cover every single bar with a television set. However, I have sought out what I consider to be the “best of class”. 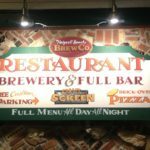 Perhaps you will be introduced to a new spot and pay them a visit during this sports season. What I did notice on day #1 of my research, was the fact that everyone I interviewed seemed to have their favorite spot. They announce the name without even giving the question a second thought! And as I soon discovered—-each bar certainly has its own personality! 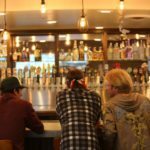 The structure, location and the bar itself are a part of the equation, however the bigger factor seemed to be the customers themselves. 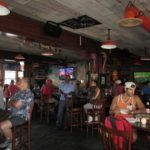 They contribute to the overall ambiance and vibe of each sports bar in a big way. Some have very loud, participatory fans, while others are rather low key. My first signal of a “vibrant sports bar” was when I heard the crowd before I even walked through the door. Once inside, I would glance around and notice all the jersey wearing, cap tipping, touchdown screaming, high-fiving, tap beer drinking crowd. Filled with enthusiasm and pride, the various groups huddle around to cheer on their favorite team and a sense of pride for their team. Hopefully the winning team! 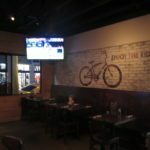 A lot has changed, in the sports bar scene over the past few years. We can now enjoy great culinary options, craft brews, and lots of game-day specials to draw us in and build loyalty. The other factor that has really improved the playing field, if you will, is the technology. 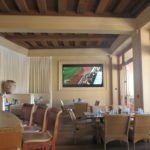 Bigger really is better when it comes to viewing the games, and large flat screens and projection screens fill the nooks and crannies of sports bars nowadays. Audio is important as well, with most paying attention to superior speakers to bring the game to life for their customers. 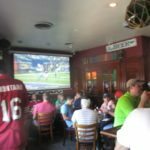 So, let’s explore some of what I consider to be the best sports bars for viewing your favorite game…. and if you have others shoot me a comment and I can go check it out and consider adding them! We all need a list like this, right? High atop Pelican Hill is the Pelican Grill Lounge which also serves as the 19th hole for the Pelican Hill Golf Course. 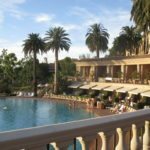 It is a regal, elegant enclave, with a bit of a Napa-style flair. The outdoor patio offers lovely ocean views. The horseshoe shaped bar is expansive, and conversational seating is sprinkled throughout the lounge area. Perched on the wall of the lounge, anchoring the fireplace are two gigantic 9 foot projection screens. The sound is audible, but not overpowering. No happy hour specials to be found here, or beer on tap, for that matter. It is a refined approach to sports viewing. This is the spot to see, and be seen. 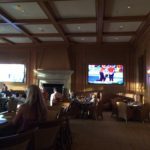 And speaking of refined, my favorite secret spot at the Resort, is by far, the Coliseum Bar at The Resort at Pelican Hill (just up the hill at the Resort). There is valet parking right out front and the pool makes for a dramatic entry. 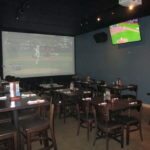 The bar has limited seats, however there is ample table seating inside the bar area and one projection screen at the far end of the bar. It is quiet and a hidden gem in my book. A bar with views of the water and docks below is 3 Thirty Three Waterfront. This bar is found on the second floor, offering the perfect viewing out onto the water. Boats can also pull up and dock just steps away from the bar. This is truly a Newport Beach haven for the boating set. The bar is huge, with elegant stonework framing the bar and colorful lights above. Every seating option imaginable is here—from high-tops to booths, barstools to couches and dining tables. It is all there. There are six big screens, three on either side, so no one has to miss a play. However, the audio is set to silent, so that is not ideal for the die-hard fans. 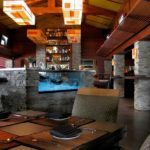 There is a private dining room, with ten four-tops, windows on two sides overlooking the docks, a retractable roof, and two flat screens. This would be a perfect spot for a team take-over! 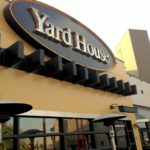 In Fashion Island, a mainstay is the Yardhouse. 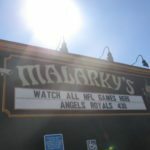 With 16 flat screens, and approximately 68 beers on tap, this is the quintessential “something for everyone” sports bar. I don’t think there is a seat in the house where you cannot catch a view of one of the 16 flat screens. The dining room is so large, that this is the perfect spot if you find your group may expand massively on game day. The space is quite flexible and the high ceilings give it that roomy feel. The Yardhorse has a plethora of special food a drink offerings for game day. They even have a nice selection of “to go” platters for those who want to have their own party at home. 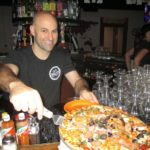 Previously known as the Shore House Cafe, Cruisers Pizza Bar & Grill pays homage to the 1970’s beach cruisers and wants to encourage their clientele to “enjoy the ride”. This is one of my favorites if you are into watching a specific game and HEARING the sound as well. They have 25 big screens and a huge projector screen in its own private dining room! Unlike some sports bars, Cruisers wanted to put a stake in the ground in two unique ways. First they wanted to present exceptional food, so they brought in a great chef. 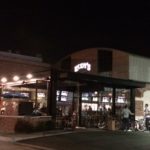 Next they wanted to improve the sports bar experience, so they have created four different areas. Each area plays a different game. And they play it loud. It feels like you are there on the field. At the hostess stand they list all the areas and which game can be found where. The dining room is bar-centric, however toward the back, there are two unique venues. One is an outdoor patio with flat screens galore, and the second is a private room reserved by fan clubs for their big games. This seats about 60 people and has a 14 foot projector screen, as well as 25 flat screens. Yes, 25 flat screens! The staff is very friendly, and one of the owners, Alex Petrosian, welcomed us and showed us around like a pro. He and his partner have been bartending for many years, and I had a few tastes of some amazing craft cocktails he was mixing up. 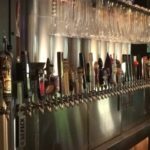 They also have 10 beers on tap and a complete bar. Just a block from the Ferry and Boardwalk on the Peninsula— this is a must visit. 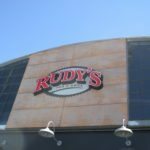 Rudy’s Pub & Grill holds the record for the most number of flat screens—with 31 big screens to be exact. 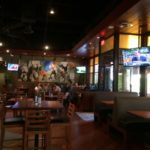 There is an outdoor patio, an indoor/outdoor area with astro-turf, and then the further interior is cozy, with wood floors and is a bit darker. When the weather is right, the entire center roof retracts, which makes for some great space. The crowd is bustling with activity and rooting on their favorite team. Waitresses are buzzing in and out with plates of food and the place is just packed on a mid-day weekend. Game on! This place rocks! 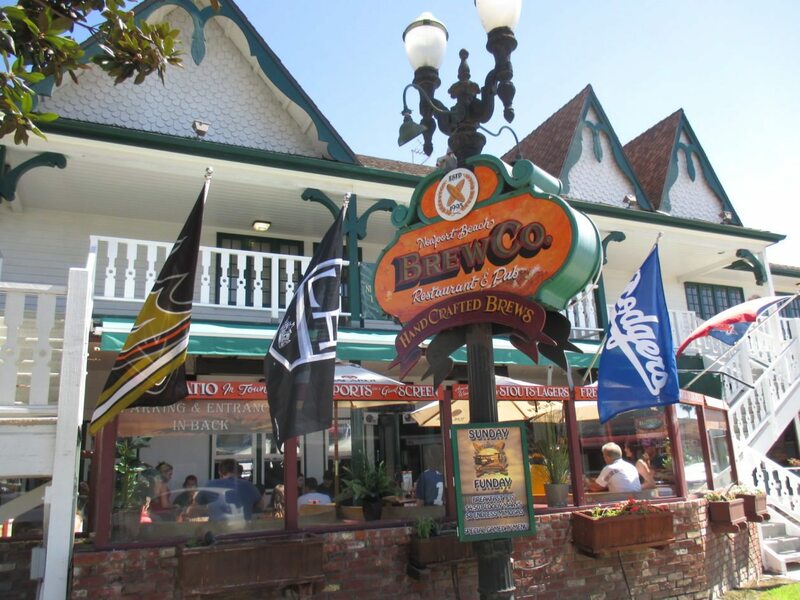 The Newport Beach Brewing Company is not too far from Rudy’s and is also hopping with activity. There is a very nice outdoor patio, which always seems to be packed. Inside there is a small dining area, and the two huge bars with high-tops throughout the building. This is another sports bar offering numerous specials—one for every night of the week. With 14 flat screens and 3 projection screens the customer’s eyes dart from screen to screen. It is non-stop action and some prefer to just stand and maneuver their way around the bars. I count 9 beers on tap which makes for a nice selection. The most boisterous and happiest crowd seemed to be hanging out at Malarky’s Irish Pub. Their parking lot wraps around on three sides which is a nice find on the Peninsula. The interior is decorated with oak and bookshelves with old books to resemble a library. With 12 beers on tap, 13 flat screens, and one projector screen. Everyone seems to find their favorite little spot either around the bar, or in the small alcoves. This bar opens at 7:30am every day, so if looking for an early morning international game, such as soccer, this may be the perfect spot. 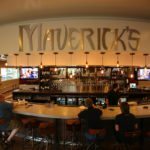 Fairly new on the scene is Maverick’s Gastropub. Their chef Mark Hibbs was nominated for a James Beard award and he has cooked for three of our presidents. 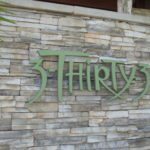 They are making the cuisine a focus for sure and the bar is welcoming. The large space is divided in the center by the bar and on the other side is the dining area. They feature an impressive list of 30 beers on tap and have 3 flat screens with games playing at full tilt. 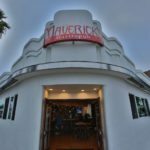 Maverick’s is located just across the street from the Ferry so it is a very convenient stop off point. Now, there are neighborhood bars as well. But they tend to foster a very local, “I have history here” kind of crowd with limited viewing opportunities. 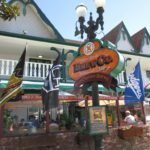 This includes, but is certainly not limited to: The Place in Corona del Mar, The Village Inn on Balboa Island, Harborside at the Balboa Pavilion, Baja Sharkeez on McFadden Square and 21st Street, and along the Newport Boardwalk (Oceanfront), the main stays of Beach Ball, Blackie’s by the Sea, and Mutt Lynch’s are all still going strong. 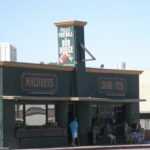 So there you have it, eight great sports bars to check out if you have not already had the pleasure of stopping in. Find your new favorite sports bar on the on this chart!